Microsoft has announced the first public version of the Windows 8 operating system has hit one million downloads less than a day after it became available. The free Consumer Preview unleashed at Mobile World Congress in Barcelona yesterday, gives anyone with Windows 7 the chance to sample the re-imagined OS. The news comes from the Windows Build official Twitter account, which announced: "One day later...one million downloads of the consumer preview." 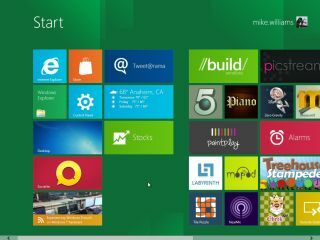 The Windows 8 Consumer Preview is the last version of the OS before the release candidate arrives, followed by the final Gold build, which we're expecting this summer. The Windows Phone-influenced version of Microsoft's primary OS will launch later this year with the first Windows 8 PCs expected to go on sale in the third quarter of the year. The new Metro interface, which will bring the Windows 8 experience to tablets, offering an entirely new navigational experience and a host of mobile-style, touch-friendly applications. However, while Microsoft says the OS has been downloaded one million times, that doesn't necessarily mean one million users have jumped on board. As one Twitter commenter says: "To be fair, I downloaded it something like 4 times."